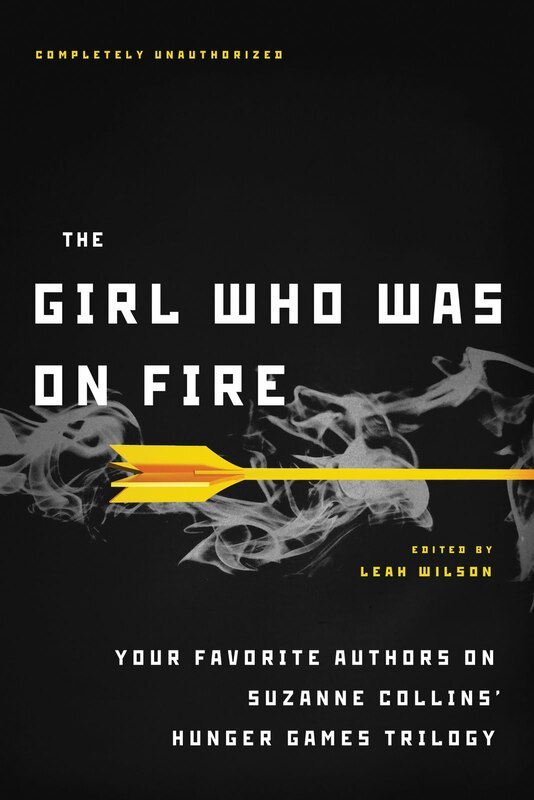 A Literary Odyssey: Thoughts on The Girl Who Was on Fire edited by Leah Wilson. 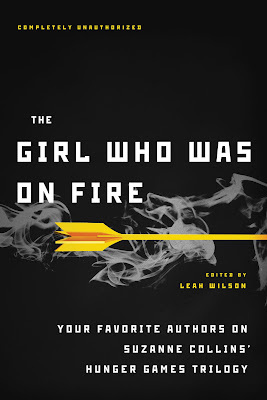 Thoughts on The Girl Who Was on Fire edited by Leah Wilson. I feel a lot of pressure to make my unit on The Hunger Games the best unit ever. There is so much that I can discuss with this book that I feel like I have to do it all! Last week, I asked you for some suggestions for the unit, and your comments were amazing. I am definitely mulling them all over as I plan out my unit. A couple of you suggested I read The Girl Who Was On Fire as a place to gather some ideas about the novel. I actually bought a copy at a Border's sale over the summer, so my copy was already on my nightstand as a resource. I wasn't sure what to think going into this book. Basically, the book is a collection of essays by various authors on different aspects of the series. I was hoping to walk away with one or two essays to share with my class, but I ended up with a LOT of information about the series in general! The essays were diverse enough to keep my attention the whole way through the collection. I thought I would be bored of reading about the series by the third essay, but I was surprised to find myself interested in each one. In particular, I thought I would hate the essays on the reality and fashion aspects of the series, since I started to dislike those sections so much in Mockingjay, but I was surprised that I really loved those two essays! Considering the fact that I am teaching The Hunger Games to high school juniors and seniors, I think those aspects of the book will really appeal to them. I already have a discussion planned around the ideas of reality, reality TV, and false appearances. I hope we can have great discussions about how Katniss and Peeta chose to act while "live" on camera. The essay "Smoke and Mirrors" really focused on those ideas, and since the first chunk of the essay stays true to just the first book, I am going to use that section in class. "The effect of this tiny, humanizing act-singing to a dying child-has immediate and far reaching consequences," (34). When I read that statement, I had to stop for a moment and think about that word choice-"child." While I obviously know that all of the tributes in the Games are children, there was something different about Rue, right? And the fact that Katniss holds on to her humanity and honors her death as a child, well, that IS powerful. Her choice to share her love has a profound impact on what happens afterward in the novel-Rue's district sending her bread, gaining other supplies from other districts and sponsors, and the choice she makes at the end of the novel with Peeta. Because rather than always resorting to violence, Katniss chooses another route. And it works. Because without that symbol of love towards Rue, would the districts have banded together to fight back? Who knows. "There is no way a young girl of 17 can handle the amount of death and destruction she sees..."
Woolston expands on this a great deal in her own essay, which is probably why I enjoyed it so much. The fact is, Katniss is a battered and bruised war veteran by the time Mockingjay comes to an end. And she is younger than those we allow to enlist in the U.S. Military! That should say something about her psyche! Because as tough and as strong as you think you are, I don't think anyone is prepared to kill another human being-especially in the circumstances Katniss was subjected to. I am sure that this will be something we'll talk about in class-how Katniss must feel. There is that section in The Hunger Games where she talks about her first human kill, and I am sure that my class will have questions about it. I'm also hoping we'll talk a bit about Haymitch, since he is another example of the PTSD that all Hunger Games Champions seem to suffer from. In all, I would say that this is a great collection of essays on the series. I was interested in all of them in some way, and I found a lot of interesting tidbits to use as discussion starters in my class. I am also looking forward to my own reading of the book with these ideas in mind. My only wish is that there was one essay without spoilers for the last two books, since I would love to expose these kids to a bit of criticism on a modern book. I will certainly let you all know how they feel about it! I want to try this book! I just read The Hunger Games Companion by Lois Gresh and it was AWFUL, but this one sounds a lot more interesting. Bent Shattered and Mended was one of my three favorite essays (along with Team Katniss and The Politics of Mockingjay). I really enjoyed this book a lot. I really have to read this. It's been on my shelves forever. This sounds fascinating. I think people are sometimes quick to dismiss this series as teen trash, but there are so many important ideas and themes that are presented in a way that truly speaks to teens -- and readers of all ages for that matter. Looking forward to getting my hands on this! I read and enjoyed the first book, but I admit I didn't get far into Catching Fire. Reading over your thoughts on the essays actually gave me a little lift and reminded me that I do want to read the other two books one of these days. Thanks for your thoughts, Allie! The Politics of Mockingjay - connection between THG and Patriot Act, scary stuff! I really have to read this one. The Hunger Games are such great books and unless a lot of other YA novels which are published nowadays the amount of philosophical, political and psychological aspects is actually breathtaking. I'm going to have to pick this book up now! Thanks for sharing it! When I read the Hunger Games, I found that Katniss seemed to remind me a bit of Frodo from the Lord of the Rings books (not movies). His inability to overcome such wretched circumstances and what happened to him changed him forever, as it did Katniss. And it also made Katniss not want to see either group in power, like Frodo in his refusal to kill anyone, evil or otherwise. And taking the reality tv and reality part into perspective, I think it's a valid point to bring this up. It's especially valid in that all of the information we receive about what is going on in the world around us is from the media. Who's to say this isn't used to make a point in one direction or another? No, it doesn't mean go looking for people covering things up or over-dramatizing things, but more be aware of this intentional and unintentional bias and apply it accordingly. This is why I love these types of books. There is so much more underneath the surface. That is what makes a great book great. Wow. Very interesting. I've heard many youtubers analyzing this series, so it would be cool to read essays on them too. Where I Come Shuffling Back to Blogging. Weekly Wrap-up for March 18, 2012. A Victorian Celebration Sign-up Post! Book 139: On First Impressions and Imagery. Weekly Wrap-up for March 11, 2012: Big Breath. Book 139: A Clockwork Orange and Book Stats. Weekend Cooking-March 4, 2012: My Recipe Binder. Thoughts on Kindred by Octavia Butler.